The South Loch Ness Access Group are organising this 180km course to be ridden over 2 days. The route consists of two loops, 40km and 50km respectively, starting and finishing at Loch Ness Riding, Dores, repeated on Day 1 and Day 2.There is also a taster class of 40km. Most of the route uses the fabulous Trail of the 7 Lochs which has wonderful views round every corner. It really showcases the fabulous Highland landscape, flora and fauna. If you are thinking of taking part in the Cairngorm 100 later in the year, this will be a brilliant training event for you. There are bronze, silver and gold horseshoes to be earned and all competitors will receive a commemorative rosette and prizes in kind for the best condition. Entry fee £100 per person. All profits will be divided 50/50 between The Equine Grass Sickness Fund and the South Loch Ness Access Group. Extra sponsorship sheets available. There will also be a Bring and Buy Sale to raise extra funds for the charities and a raffle. If you have anything to donate please contact Candy (details above). 21st May 2016 at Loch Ness Riding centre, Dores. Draw will take place at 9pm. In aid of Equine Grass Sickness Fund and the South Loch Ness Access Group. A remedial or sports massage with Sianan Jackson. A free Rug wash/proof with Ashleigh Reilly. A 2 hour Equestrian or family photo shoot with Karen Wotherspoon. A free treatment for your horse from Gina Peasnall. A day ride at Highland unbridled including on the beach. 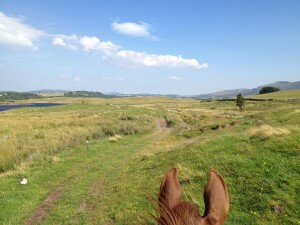 A day at highland horse fun in Kingussie either driving or riding. If you want to buy raffle tickets, please get in touch – they are £1 a ticket so please stick around for the draw and enjoy some food, drink and entertainment.